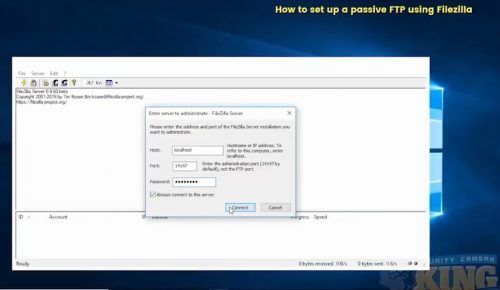 The purpose of this article is to show you how to set up a passive FTP using FileZilla. Follow along with the steps and images provided or skip to the bottom to find the tutorial video. 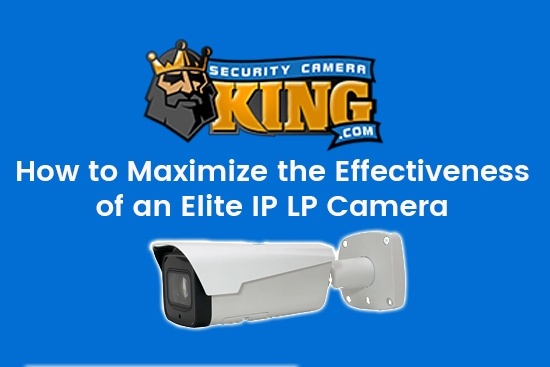 For more assistance contact Security Camera King here or call 866-573-8878 to speak with a member of our technical support team. 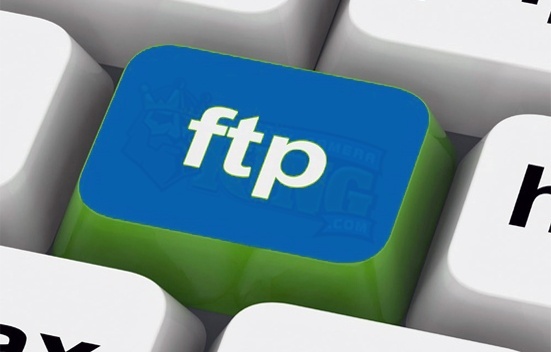 Continue reading to begin the passive FTP server guide. 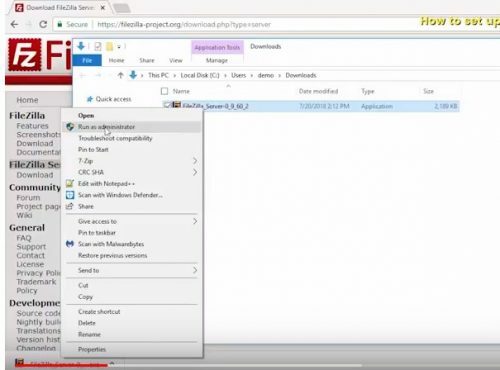 Open a new tab or window in your browser and search for FileZilla on a major search engine. Continue on to the official site (https://filezilla-project.org/). 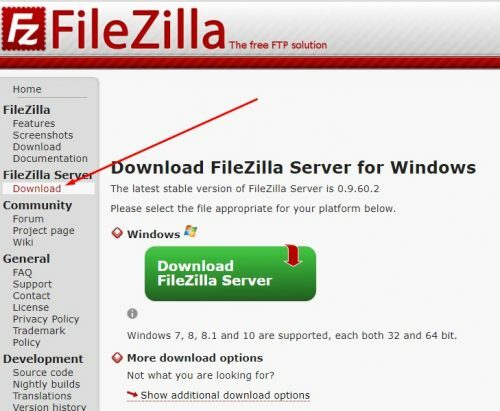 Click on Download FileZilla Server and begin downloading the FileZilla server file. Once the file finishes appear on the bottom of the screen, open the file. Right-click the application and select Run as administrator. The License Agreement should pop up. Verify that you understand the terms and conditions and select I Agree once you are ready to move forward. Next, choose your preferred components and select the type of install you want (if you are unsure then keep the default selections). Select Next on your preferred file path or destination folder. Then, in Startup settings, you will need to go ahead and give this a custom port. For the purpose of this example, we’ll just use the default. Lastly, once you select your preferred startup behavior options for the FileZilla Server (if you are unsure then keep the default selections) – select Install. After the file completes the installation process you can close the installation wizard and allow the application to open. The prompt to ‘Enter server to administrate’ will begin. Go ahead and create a password for yourself. For this purpose of this example, we will use admin123. Make sure the box next to ‘Always connect to this server’ is selected and click on Connect. Next, you will need to allow the application to communicate through any firewall put in place. First, click on ‘Change settings’ and make sure the selections for FileZilla Server are checked for both Private and Public (which it should be by default). Then select Okay. Right click on your home screen to create a new folder for the directory. For the purpose of this example, the new folder will be named ‘FTP’. Open up the FileZilla server again and once inside the application, select the Edit drop-down menu. Then select Settings. Welcome message under General Settings is where you can customize a message to be sent to each connected client (such as “You are connected!”). 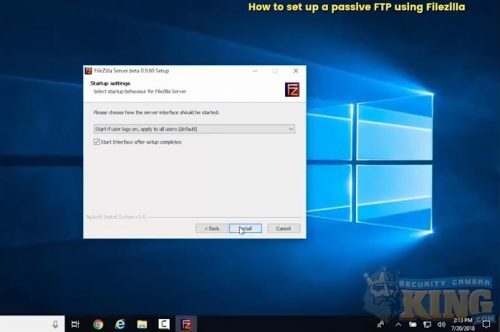 Because a passive FTP requires the application to be in Passive Mode, you will need to configure Passive mode settings. This is where you will need to enter the IP address for passive mode transfers. 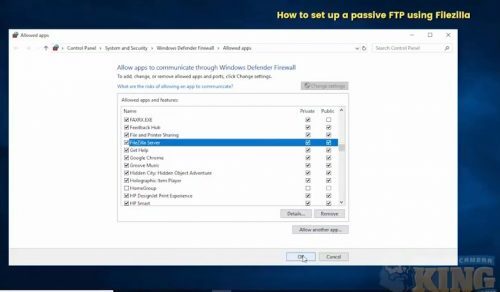 Outside of the application, open up Command Prompt on your computer and type in the following: ipconfig. 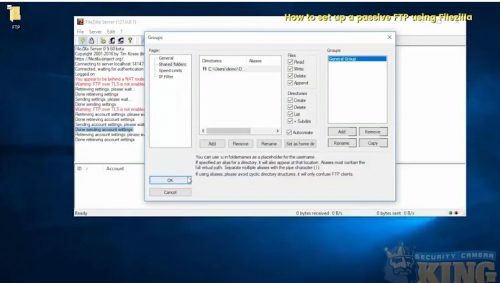 This will give you the IP address of your computer. For the purpose of this example, the IP address is 192.168.1.38. Go back into FileZilla and enter your IP address in the box under ‘Use the following IP:’ and select OK. Now that it is enabled it will ask you to create a user. Select the Users icon (image of an individual person) and then locate and click on ‘Add’. Enter the name you wish to add to the user account. For the purpose of this example, the user will be named ‘Demouser’. Now select OK.
Next select ‘Shared folders’ inside the Users menu. Now select Add to make a new folder for the directory. Locate the folder you previously created on your desktop (FTP) and select it and press OK. Now give it the level of access you want (Read, Write, Delete, Create, Delete, List, Subdrs). You can also alter the Speed Limits or IP Filter settings now if you wish to. Once you are done, select OK.
Next, select the Groups icon (image of multiple persons) and select Add to create a new user group. Enter the name you wish to give the user group. For the purpose of this example the user group will be named ‘General Group’. Now select OK. Repeat the steps from Step 9 to add the folder to the directory and give it the level of permissions you prefer, then select OK. Select the Users icon again and make sure the new user you added is selected (Demouser). Select the drop-down option next to ‘Group membership:’ and select the new group that was just created (General Group). Select OK. Lastly, open Users again and give the new user a password. 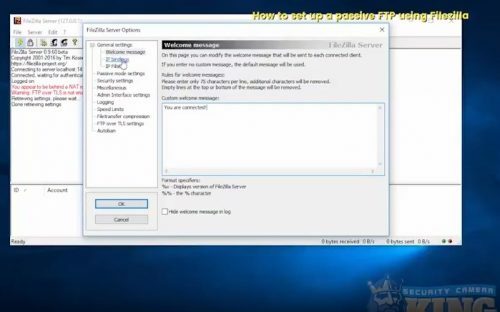 Select OK.
That completes the tutorial on how to set up a passive FTP using FileZilla. Thank you for following along and be sure to watch the tutorial video below if you have any difficulty understanding the steps above. 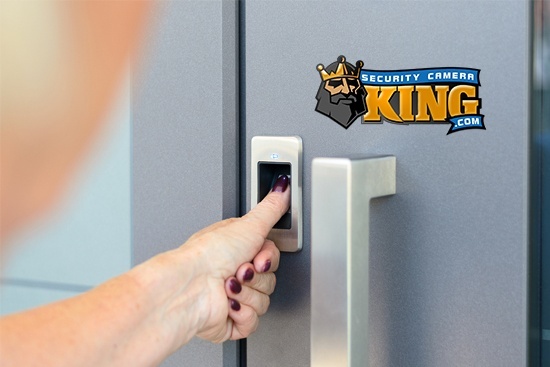 Visit our website to watch other helpful videos or to shop for security cameras, CCTV products, video surveillance, and access control equipment online. 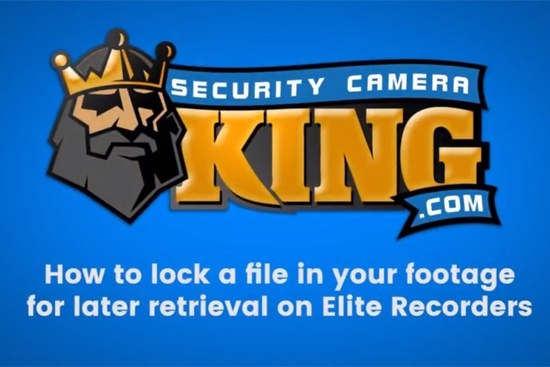 Make sure to follow Security Camera King for more informational guides, tutorials, security camera reviews, and more.